You know how sometimes you come across something that’s so cool you just want to eagerly share it with everyone? That’s how I feel about neat. 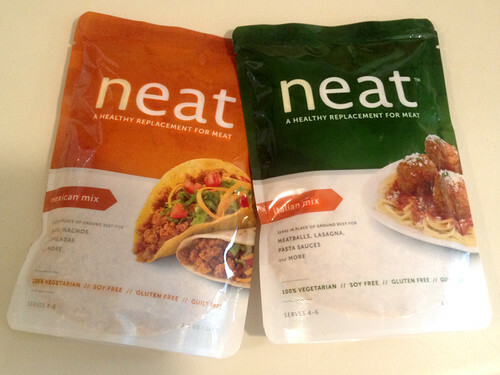 I had already heard Bianca of Vegan Crunk rave about neat after her visit to the Seattle VegFest– so I was super excited to try this new nut and grain-based “healthy replacement for meat” when neat sent me a few packs to try out! First of all, just admire how clever this product is: It’s a mix in a bag – all you have to do is add water and eggs (or vegan egg replacements), and voilà – dinner! (or lunch, actually, in my case). It’s soy-free, gluten-free, and vegan if you cook it with vegan egg replancements. I halved the recipe, since 4 burgers is a bit much for one person! I used a regular egg, since I’m a vegetarian – but I’m going to have to get my hands on some vegan egg-replacements to see how well it works with those too. 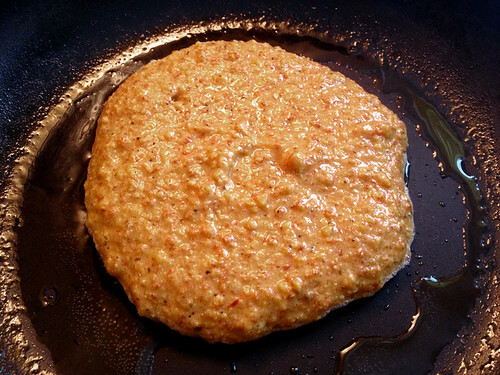 I was nervous about how liquid the mixture seemed after I mixed it all together – the instructions said to form into patties, but instead, I just scraped the batter into the frying pan as if I was making thick pancakes. The instructions didn’t mention whether to fry it in oil or not – so I tried one patty with oil, and one without (both on non-stick pans). Both worked fine. They cook quickly, so keep an eye on them! And the egg makes them expand, so don’t worry if they look small to start. 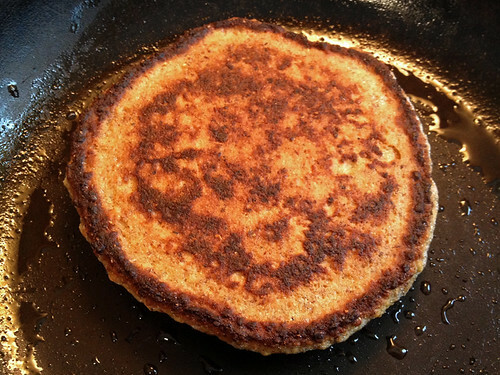 Still feeling like I was making pancakes, I flipped the patty over to cook the other side. Mine didn’t look exactly like the photo on the package, but it smelled good, so I was excited to taste it. 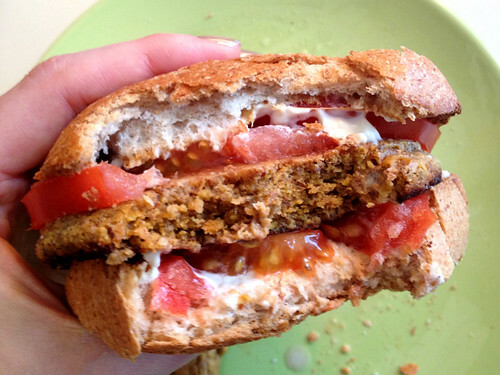 I had some whole wheat rolls on hand, so I did a simple burger with just mayo and tomatoes for toppings. And how did it taste? Great! 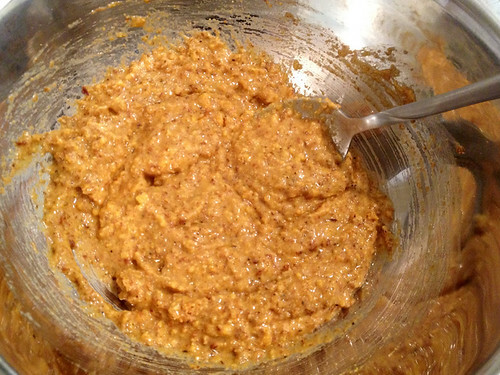 I was surprised at how much delicious flavor was packed into that mix. 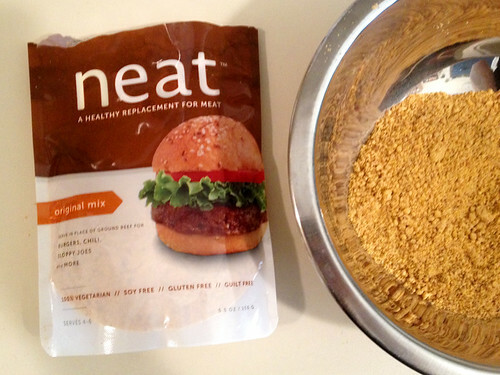 neat is made from pecans, garbanzo beans, gluten-free whole grain oats, and cornmeal. And although it looks like a fine powder when you start mixing it, once it cooks up in the frying pan, it actually gets a really nice texture – very much like a crumbly, ground meat! 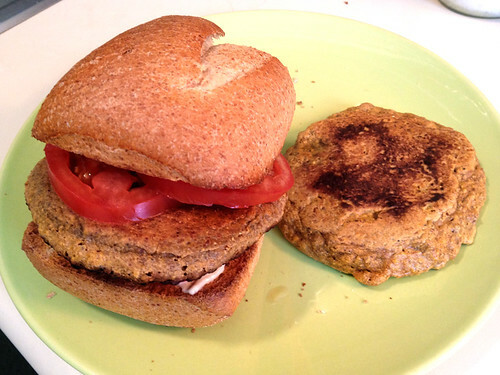 I felt like I had just done a magic trick, making a tasty burger like this from a powdered mix in a bag! And I love how versatile it is – you could add any seasonings you like, and cook it in any shape or form you desire. neat also sent me samples of their Italian and Mexican seasoned mixes, so I’m excited to try it out for meatballs and tacos next. With how easy it is to make, and how quickly it cooks, I think this would be an awesome product to bring on camping trips! 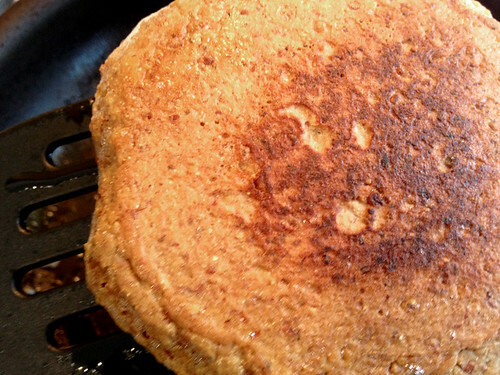 While you couldn’t cook the burger patties on a grill (too soft), neat would fry up really well in a pan over a campfire. And with four servings per bag, this 5.5 oz package would hardly add any weight to your backpack. I will definitely report back once the weather is warm enough for some backpacking trips this summer! You can order neat online – but I was pleased to see that there are some local stores in NYC and my own neighborhood of Astoria that also carry this product: Natural Frontier Market in Manhattan, and Broadway Natural in Astoria (neat’s representative told me they recommend calling ahead to make sure neat is in stock though). price: As previously stated, I received a complimentary sample of these from neat. On their website, a package of neat (4 servings per package) sells for $4.99. I've just started hearing about this product too; thanks for explaining those really cool (you thought I was going to say "neat" didn't you) ingredients!